If you are considering brunch tomorrow and find yourself at Yonge and Dundas, I encourage you to go southeast towards Victoria St. and look for The Senator. Its facade make it seem small but what is inside is a total surprise. You would literally go in deep into the restaurant to enjoy a meal. I was there a month ago to meet up with my EyeCandyTO business partner, Abe Wornovitzky. Business meetings always just fly by whenever we pair it with a meal, so why not brunch? I have heard of this place countless times I thought it was time to check why it is popular with foodies. We are lucky that there was a short line when we walked in. The story 10 minutes after we lined up was entirely different as the queue got longer behind us. I spent the waiting time looking around all the retro paraphernalia around me. I totally enjoyed that they still have a pile of newspapers in the bar just right beside a Coca Cola soft drink dispenser. Just by the line was also the dessert table in full view. There is something so comforting in seeing scrumptious cakes in a line. From what I hear their breakfast plates tend to be generous, I doubted that I would have space for dessert. We finally had our turn and we were led to a table. They really maxed out the space, finding a way to make 2 tables fit in a space of one. It was a squeeze but I didn’t mind. The divisions between tables and the high ceilings afforded us some privacy. Somehow it dialled down the noise level around me. For that day I somehow had some craving for baked beans so I opted for Berkshire Bacon (but of course) and eggs that came with a side of maple baked beans, home fries and toast. Abe went for Salami and eggs and just like me, he had the maple baked beans, home fries and toast on the side. What we surely both loved was that their coffee was REALLY good! Smooth, creamy, warm and regularly refilled, I lost count on how many I had for breakfast. LOL. Pushing the envelope some more, we even added the Caramelized Banana pancakes for that morning to satisfy our curiosity. But for some reason, the waiter must have forgotten to scribble it for us, it never arrived. When we reminded him about it, we were hoping that they did forget as we were already full. And that is when we discovered that they are ok to sell it by the piece so we asked for only one just to try. It was light and fluffy but I think my bacon and eggs with the baked beans won me over, my craving overly pacified. 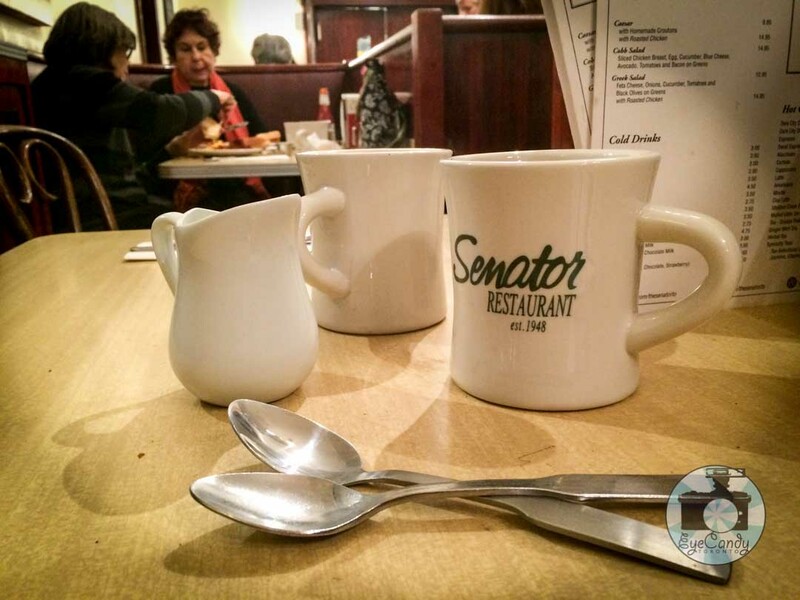 So if you are contemplating of heading out this weekend for a savoury brunch, walk in through the doors of The Senator. I guarantee, you would walk out with a very satisfied tummy.